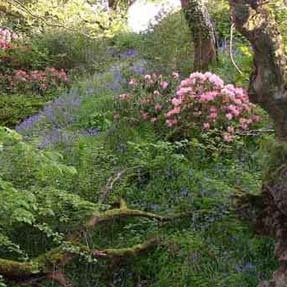 The sheltered garden of Nant-y-deri is situated in the rolling border vale of Glamorgan at 92M (300′) i.e. between the coastal plain and the steeper and more dramatic valleys in the South Wales Coalfields. It is south-west facing, incorporating a fairly steep wooded valley and stream running north–south. The soil is very sandy and stony being glacial moraine and the pH is neutral to acid. The climate is mild and damp but not so frost-free as the Glamorgan coast. The garden’s own valley is a frost pocket. The wooded valley has been planted to enhance the existing mature trees and integrate with the natural flora. At the bottom of the valley there is a bog garden alongside the stream. Great use is made of shade beds in the wood environs and the strategic use of climbers to complement the woodland of predominantly native oaks. Unusual plants and rare varieties are favoured wherever possible. The lower lawn has a small wildflower meadow, and is edged by shade beds on the one side and an extensive mixed border on the other west facing side. Towering above the top lawn is a magnificent oak tree topped by Rosa filipes ‘Kiftsgate’. Less hardy plants are sited against the south- and west-facing walls of the house and garage. Within the garden is the Nursery — Bordervale Plants — which specialises in unusual perennials and shrubs (many of which can be seen growing in the garden) as well as cottage-garden plants. New areas of the garden are being developed and extended, bringing ever more varied interest and new ideas.